Shyamalan was born in India but raised in Philadelphia, where he attended a private Catholic school. Inspired by the films of Steven Spielberg and Alfred Hitchcock, he began experimenting with an old-fashioned 8mm camera. By his 16th birthday, he had made 45 short films. In high school, he edited his senior yearbook, and included a full page phony Time Magazine cover, a photo of himself in his director's cap with the headline, "Best Director: NYU grad takes Hollywood by storm". His father, a doctor, wanted him to go to medical school, but his mother, also a doctor, encouraged him to attend film school at New York University. His first two films flopped. Praying With Anger, a 1992 autobiographical drama starring Shyamalan as a young Indian-American who visits Madras, was screened at the Toronto Film Festival, but poorly received and not distributed. Wide Awake, a 1998 comedy with serious overtones, told the story of a young boy grieving for his dead grandfather and asking spiritual questions about Grandpa's eternal fate. Despite several stars in the cast, including both Rosie O'Donnell and Camryn Manheim as nuns, the reviews were dreadful and few tickets were sold. 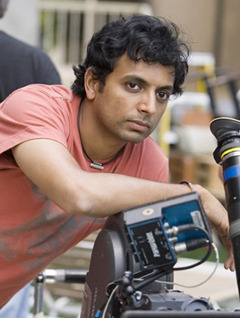 Shyamalan had written and sold a script titled Labor of Love with the proviso that he would direct it, but after Wide Awake the studio balked and the film was never made. To make ends meet, he did rewrite chores on the film adaptation of E. B. White's Stuart Little. Meanwhile, Shyamalan pounded out The Sixth Sense. It took him one pitch to sell the script. Starring Bruce Willis, Haley Joel Osment, and Toni Collette, it earned a quarter of a billion dollars just in its American theatrical release. Shyamalan has since made more thrillers, Unbreakable, Signs, and The Village. His films are known for unexpected plot twists, and Shyamalan is understandably touchy about keeping the details quiet. He has hinted that he sometimes goes on-line to message boards under non de plumes, just to post misleading information about his movies. Married to his high school girlfriend, Shyamalan still lives in Philadelphia. His production company, Blinding Edge Pictures, is headquartered there.